FN 5.7MM PISTOL WITH GEMTECH TM-SFN-57 SUPPRESSOR, GALCO 5.7MM HOLSTER AND JARVIS 5.7X28 THREADED BARREL. $1799 shipped on a card! THE GUN IS BRAND NEW, UNFIRED, THE SUPRESSOR AND BARREL HAVE BEEN TEST FIRED 20RNDS FOR FUNCTION CHECK IN MY 5.7 PISTOL. THEY RAN LIKE A TOP! THIS IS EVERYTHING YOU NEED. 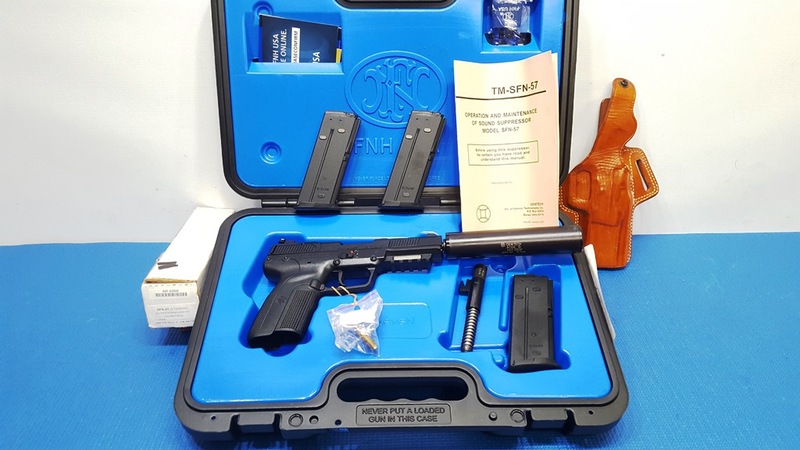 THIS NEW FN 5.7MM PISTOL WITH GEMTECH TM-SFN-57 SUPPRESSOR, GALCO 5.7MM HOLSTER AND JARVIS 5.7X28 THREADED BARREL IS FOR SALE AS A PACKAGE DEAL, i WILL NOT SEPERATE. THE GUN IS BRAND NEW, AND STILL UNFIRED, THE SUPRESSOR AND BARREL HAVE BEEN TEST FIRED 20RNDS FOR FUNCTION CHECK IN MY 5.7 PISTOL. THEY RAN LIKE A TOP! THIS IS EVERYTHING YOU NEED.